 There's no semblance or pretense of balance in this unauthorized biography of New York's scandal-plagued three-term senator, Alfonse D'Amato--a lack that is both the book's failing and the source of its fascination. The only kind words Lurie (The King Makers, 1971) has for the man who rose from the bottom ranks of Long Island's Nassau County Republican Party to become one of the nation's most powerful politicians are compliments for his adroitness in evading indictment. The author's tone is nasty, and D'Amato's side of the story is nowhere to be found in a rambling, sometimes tedious chronicle. All that said, the book is a must-read for students of American political history. Lurie has assembled a mass of evidence from the public record, from his attendance at several sensational trials, and from interviews. He takes the reader from scandal to scandal and describes, often with incredulity, the way in which D'Amato has escaped unscathed each time. The trials are the heart of the book. In the first, in 1980-81, D'Amato mentor Joseph Margiotta, head of the Nassau County Republican Party, was sent to jail for taking bribes from insurance agents (including D'Amato's father) doing business with the county. In the second, in 1985, a letter written by D'Amato was a key piece of evidence in proving the party guilty of demanding kickbacks from county employees. 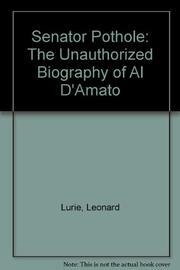 In the third, D'Amato's brother, Armand, was sent to jail in 1993 for soliciting bribes from a defense contractor. It is Lurie's contention that in each case--and half a dozen other brushes with the law that he describes in detail--D'Amato was saved by his consummate skills in maintaining plausible deniability or by some stroke of fortune. Senator Pothole, a nickname D'Amato loves, has progressed in 32 years from dunning sanitation workers to leading an attack on the president of the United States for alleged ethical lapses. Anyone who would understand this remarkable journey must read Lurie's book.